No one should be surprised that I read Elephant Company: The Inspiring Story of an Unlikely Hero and the Animals Who Helped Him Save Lives in World War II by Vicki Constantine Croke. On this blog I have reviewed at least six elephant books, including The Elephant Scientist and The Elephant Whisperer recently. Also, I have featured news about the David Sheldrick Wildlife Trust, which operates elephant preserves in Kenya. Elephants, pandas, and birds are high on the scale of our interests in our household and at this book review. Closer inspection of the three titles above reveals that the books are also about people who study, protect, and work with elephants. In Elephant Company, the subject is Billy Williams, who went to Burma in 1920 to work with Bombay Burmah Trading Corporation, a British company that harvested teak logs from rain forests. Williams had always loved and worked with animals in his native England and quickly developed the skills of an elephant veterinarian. Working closely with the mahouts who road the elephants as they hauled logs, Williams introduced more humane treatment of elephants, lengthening their lives and saving the company having to capture more wild elephants - dangerous work that often involved injury and death of elephants and humans. 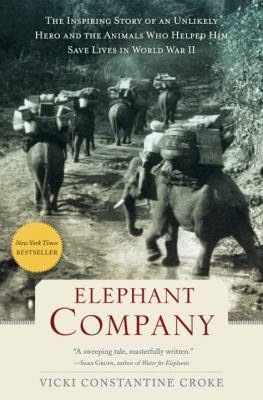 Elephant Company compares well with the other elephant books that I have read. The author tells a story that seems new to contemporary readers but would have been known to many newspaper readers in the 1930s and 1940s. She vividly describes life in a remote region of the waning British Empire and recounts a horrific period of Japanese occupation of Southeast Asia. She also celebrates the relationship between Williams and an elephant known as Bandoola. I enjoyed several happy days of reading. Croke, Vicki Constantine. Elephant Company: The Inspiring Story of an Unlikely Hero and the Animals Who Helped Him Save Lives in World War II. Random House, 2014. 343p. ISBN 9781400069330.